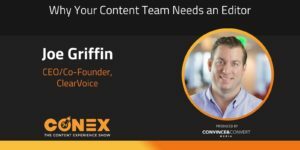 Joe Griffin, CEO and Co-Founder of ClearVoice, joins the Content Experience Show to discuss strategies for consistently creating good content and the importance of a single editor. Good content is crucial, and to get good content, a good writer is crucial. Is that the bottom line, however? Get a good writer, and content is sure to follow? Unfortunately, regardless of how good your writer may be, an environment that isn’t conducive to creativity and leaves too much of the process on their shoulders can actually lead to lower quality and even less content. According to Joe Griffin of ClearVoice, you have to give writers an environment that fosters their creativity. This includes allowing them to focus on the writing, and only on the writing. This is where the editor steps in. While many companies make the mistake of expecting their writers to be both writers and editors, having a dedicated editor can give your writer the freedom to live in their creativity and continue to produce stellar content, while your editor ensures the consistency of your brand voice. Why a good managing editor is so important for creating good content in today’s market. Why there should be one editor or editing department rather than editors spread throughout multiple departments. How to set up a practical content creation plan. We learned a little bit about your obsession with video gaming. Maybe you can give us an idea of where you geek out on that stuff. Joe is a huge fan of historically themed video games like Civilization and also spends a lot of time playing multiplayer RPGs like Defense of the Ancients! Are you a fan of VR or a non-fan? Joe says he “kind of loves” VR but has a hard time imagining dedicating the necessary space to it in his own home. Anna Hrach: Hey, everybody. Welcome to "The Content Experience Show" podcast. I'm here with the always amazing Randy Frisch from Uberflip, and I'm Anna Hrach from "Convince & Convert." Now today we drop a lot of information on you guys, but we just couldn't really help it. Joe gave us so much great information, this is Joe Griffin from ClearVoice. He gave so much amazing information into voice and tone, and brand guidelines, and writers, and hiring freelancers. Randy, I feel like this is just packed full of information today. Randy Frisch: It really is. At one point I thought he was going to make it to "Mickey Mouse." I don't mean that in a bad way because he started with like, "Here's how to create content out of the gate." But that answer itself was even so good. For companies struggling on "Where do I get started?" Then all of a sudden out of nowhere, he takes us to this whole other level. It's like, "Then when you want to scale, here's what you're going to do with your content. Here's all the things that you need to have in place." I don't know about you Anna, but I could relate to those growing pains, but he took us through those growing pains and solutions in an amazing three, four minute answer there at one point. Anna Hrach: Totally. Yeah. I was having ... He starts off talking about how content was commoditized at one point and now we're coming out that. Literally, everything he was saying the entire time, I was getting flashbacks of my writing career in my head and being at previous agencies and really having to fight for quality content and what that means. He talks about the importance of an editor and I just could not have jumped up and down more while he was talking 'cause it's all great stuff and especially from my perspective from content, there's a lot of really great stuff in here. Randy Frisch: Yeah. The part that I related to more on the CMO end of this was this struggle that some of us have once we start to create content where how do we get some standardization? How do we get everyone to buy in, if you will? Because before you know it you have product marketing out there saying something. You have content marketing out there saying something and all these other groups and one of his bits of advice that I'll let people listen to in full when they get to the recording is this idea of a central editor, the general editor, if you will who's going to edit for all voice coming through. One of the things that we did at Uberflip - I know I've shared this with you, Anna, before - is we set up our own brand guidelines to get buy in from all those group. If people want to check it out, too, it's at brand.uberflib.com. You can go. It's a public tool, but it really helps guide our team internally to make sure everyone's staying on the same page. Anna Hrach: It's gorgeous. Everybody should just go there because I think, Randy, one of the things that I love about your style guide too, which is also what Joe talked about, is you don't have to have things be an encyclopedia of brand guidelines. If you have those core elements and it's useful and it's usable, people are going to use it, especially in my experience when brand guidelines do get to be like the "Encyclopedia Britannica," people don't look at them. But, Randy, I think you guys have put together something that is beautiful. It's useful. It's usable. It's easy to navigate. I think it's awesome. Randy Frisch: Thanks. My favorite part of it is the part called brand personality. I don't know if you had a chance to check that out, but I take a lot for Anna Handley on this one. If people don't know Ann at Marketing Prospect, she gives great examples of companies that have these personalities where you go to their site and no matter what you read on their site, it goes back to either a very, fun playful approach or sometimes very serious, depending on who your audience might be and how you think you can capture them. I think pulling this back to Joe, I think that's a big key takeaway today, is how do you make sure that your content is aligned? We'll roll this podcast any moment here, but I don't know about you, Anna, but that to me is the biggest concern at scale is how do we align? Anna Hrach: Absolutely, especially when content is being created from so many different places. How does it all sound like one cohesive vision? But yeah, I think you're right. I think we should just go ahead and bring Joe in. I think you actually brought him in so we should just bring Joe in and let him talk about all of these things for himself. 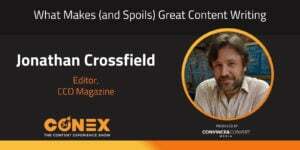 Randy Frisch: Hey, Joe, thanks so much for joining us here on "Conex." Maybe you could start off for us and tell us two things. First, a little bit about you; what your role is in your company. But at the same time, we'd love to understand from you since you're the co-founder, what is ClearVoice all about? Joe Griffin: Absolutely. Thanks for having me, Randy and Anna. I really appreciate it. I'm excited to talk to you both today. Yeah. 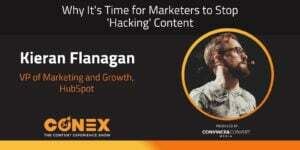 I love talking about content creation and what it takes to really have a powerful voice out in the market and building thought leadership and driving traffic and generating leads and all of the things that everybody wants to do when it comes to creating content and the reason why we do it. Something I'm certainly passionate about. My core I think responsibilities inside of ClearVoice is making sure that we're really evangelizing that particular message and that we're always building products and tools to help brands and agencies and the freelance community best tell their stories and be able to work together in really efficient ways. That's what we're all about. We've been doing this now for about five years in terms of ClearVoice, but would love to tell you more. Anything in particular you want me to dive in on? Randy Frisch: Yeah. One thing I'd love for us to talk about today is you've obviously gotten to know a lot of different great content creators. The bars are definitely raising over the years. It used to just be "create content and then people will find you." Then we got to a point where we had to create great content. You would think it would have been great on day one, but especially as there's so much out there. Maybe you could give us some of your key attributes you look for in a great content creator, starting with their background, their skill set, things like that. Joe Griffin: It's an interesting industry. You definitely got it right in terms of how you're talking about it. I think some of the trends and some of the things that have evolved over time have changed the definition of what a great content creator is. And if you just go back a little bit and think about 15-20 years, it was really all content was really still controlled by big media. There was really five big conglomerates, or give or take, that controlled most of the content that we were seeing, whether it was video, whether it was print and even for the most part, digital. Then, a lot of shake-ups obviously have come down since digital became popularized and that really changed a lot of the ways that we, as brands and agencies, interact with creators. It opened up a lot of new opportunities, but it also created a good and bad commodity system for content. For many years, 10-15 years, there was a trend of ... high volume low quality content, mostly to feed search, mostly for SEO purposes. Google actually came out in 2012 with the Panda update and that update in many ways I think was the nudge that the industry needed to move away from that that type of commoditized content and get back to that higher quality content. I think brands understand that. They've understood that since it occurred and there's been definitely a shift. It's taken several years I think to get back to that meaning of "Let's really create great content." When you're thinking about creators, and you're trying to figure out who would we work with to produce content that is high quality and that is in the voice of our brand, you're going to be really looking at ... are we building out an in-house team? Or are we going to be going the freelance route? That's a really important decision to make. The reason why I gave that backdrop about some of the industry changes is there are new roles that have emerged and there are still emerging roles in the area of content. One of the emerging roles is the prevalence and the importance of the managing editor and what it means to be a managing editor. There are a lot more managing editors now than there used to be and there's probably going to become still even more than there is today. The reason why that is is because the managing editor now is really the gatekeeper of the brand voice, the person responsible for vetting and managing talent, for keeping things on timelines and routing content through all the various approval processes that every company has. That managing editor role is extremely important, and it's something that companies who are struggling with creating content, they can't put their finger on it. They want content. They want great content. They've even got a budget for it, but for some reason they can't hit those basic content milestones that their setting. A lot of it has to do with they probably don't have or may not have the right managing editor in place to oversee those things. I would just say that's a key role that goes about vetting. I ... know on your end, you have a managing editor. Obviously, you're doing a lot of things right in that area. Anna Hrach: Yeah. Joe, I seriously cannot agree with you more. I think for too long the industry has really been focused on content creation, therefore equals content creator or content writer. The role of an editor is so undervalued, it's criminal. There even in times I've written things where I've been like, "Ah, man, this is great. It's on brand. It's on voice and tone. It's good to go." Then it goes to an editor and they're like, "Yeah. I don't know what you were doing on this. You had a random thought here." I'm like, "Oh, yeah. You're right." Just those little tweaks and tightening up and just even managing the workflow. An editor is, again, criminally undervalued. I cannot agree with you more. ... I think these two things kind of go hand-in-hand where you had mentioned we're coming out of this commoditization phase. We try to get the most bang for our buck still out of writers, so we expect them to be editors. We expect them to be proofreaders. We expect them to be managers and project managers in addition to content creators and creatives. What are some tips and tricks even just some advice you would in part onto companies who are maybe on the fence and thinking a writer can cover that managing editor position? How would you help them understand the value of that editor and someone who can manage all of that content? Anna Hrach: Like it's magic. Joe Griffin: Yeah. Exactly. It's not the case that a writer will cover those different positions. I would even go further to say that to get great writing, you need an environment of creativity. Just like a designer or like any creative needs a certain type of environment to be creative. Writers are the same. I think that's another odd thing that maybe we're just starting to better understand. I don't know why that would be the case, but I feel like we're just better understanding that they also need a creative environment, which is one of the reasons we are really big advocates for the idea of remote work or freelance work for writers because it's also kind of criminal to go, "Okay. 8-5, sit down. Don't go anywhere. Write this creative thing now," whether you're in a creative mood or not, right? Sometimes the creative mood might be 7 p.m. or 1 a.m. or 4 a.m. or whatever. It's really a different type of role. I think writers really need the freedom to be creative and need creative environments. What works best is by giving them specific instructions of what you're looking for and that's where you need some of that strategy to come into play, where you need that managing editor who can issue assignments and manage deadlines, but you have to have an editor. When we think about editors, there are two types of editors. Now a managing editor can play both roles, but there's also a copy editor. Depending on the amount of volume that you have, that you're creating, you may need a copy editor, or a part-time copy editor. That's really the opening paragraph, the sentence structure, the grammatical value, maybe even the content styling, the bulleting, the closing paragraph, those types of things where a copy editor can come in and take something that maybe is at 85% to 95% in terms of coming from the writers hands. Then your managing editor overall managing the assignments, the deadlines, the talent themselves. In a smaller production environment, your managing editor would probably also be your copy editor, or you might just freelance your copy editing, but you do need that. You really have to have at a minimum two people on your content team to produce even a small amount of content or three. They don't have to be full-time employees. They could be part-time employees. They could be freelancers, but you have to have someone who's in charge of strategy. That could be your managing editor. You do have to have the actual operational managing editor, including the copy editing. Then let writers just do what they do. Don't try to make writers do more than they do. Sure some of 'em can, but the most important part is you have at least two sets of eyes on a piece of content because even the best writers in the world will miss the voice sometimes. They will have grammatical issues. You still have to have two sets of eyes on every project. Randy Frisch: I'm really enjoying this and partly because I was sitting in a meeting today here at our office. We were talking about our ability to crunch through all the content requirements. It's a great time that we're having this 'cause I'm going to take whatever you tell me now, Joe, right back to my team. I think any CMO or VP or director level manager who's listening here is probably going to wonder on the answer to this too, which is a lot of what you're describing sounds like a media company. You said that at the beginning. These are the challenges that media companies have been battling for decades as organizations, as companies that are trying to drive revenue, we're now realizing the value of this. But how do you define the role of that editor in terms of editing; let's call it the content marketing, the thought leadership, the inbound assets versus all the other needs that are coming through our company because I think that's where we're starting to see a lot of debate in companies is should our content team also now manage what you called "brand voice" at one point here? Like the product marketing assets and the one page overviews. I personally feel like that line is starting to blur and it's getting really hard on some of the teams I talk to. Joe Griffin: Yeah. I totally agree that the lines are blurring and it's something that we deal with, too. It's a really interesting kind of dynamic where you've got your product marketing teams. You got your content marketing team; sometimes those are separate groups and then sometimes those groups are combined. You may even have corporate communications at some level or some kind of brand marketing team. There are all these different kind of "tribes" almost in marketing that all have a common goal, but may have different directives, different objectives in terms of how they want to execute marketing. I do think that the lines are blurring in terms of who owns content and that's something that everyone has troubles with, too. It's like, "Who actually truly owns content? Is it truly owned by anybody?" I do think it should be owned by someone. I think there has to be one or two people in the company that really own it and can drive ... And they're responsible for creating the voice. They're responsible for identifying the tone. Now they may have to collaborate, right? They may have to collaborate with Corpcom or the brand team, depending on the size the organization. Even in a small company, they're going to be coordinating directly with the CEO, but having the core brand voice, the tone, obviously the mission, the vision, all those things aligned so that all departments are in their own way creating content that still aligns with that core brand voice is really key. I would say that ... You asked specifically about what's the role of the editor? To me the editor should probably live in one of those departments. You shouldn't probably have editors all over the place. One ... You should define who's the core content department. In our company, we actually have ... a director of content marketing. We also have a director of product marketing, and the product marketing director does tons of things to the product, and she produces tons of content and not all of that has to be necessarily approved by our director of content marketing, but that department still owns editing. We have one department that owns editing because at the end of the day everything has to come back to alignment, and the way that we communicate message to our customers. I would think that's the takeaway here really is one person or two people have to own editing instead of a single department. All content should route through that department. Anna Hrach: Nice. I love it. Yeah. I couldn't agree more. There should always be that final gatekeeper that really sees what everybody's doing, make sure it all ties together. Joe, I want to get more into voice and tone and things like that and some of the mission, vision, values that you talked about. But real quick, we're going to take a super quick break to hear from our sponsors so when we come back, we're going to talk about voice and tone and the other amazing brand goodies that writers use and we can help provide to them. Hey, everybody. Welcome back. We are here with Joe Griffin from ClearVoice. Now, Joe, before the break, you started talking about voice and tone. Voice and tone and brand guidelines are things that I am insanely passionate about and I feel like absolutely no writer should be able to create content without at least having an outline of these things. Based off of everything you've seen and even how you operate internally with creating content, what kind of documentation is really necessary for writers to really start? Joe Griffin: I'm in agreement. That's something I'm passionate about, too. I believe that in order to create high-quality content and more importantly, to get the output that you're looking for, you really have to lay a lot of that important foundation. There's also got to be some ongoing availability to that creative team as they have questions to make sure that they're on the right track. What I would caution a little bit on when you think about setting a foundation is don't wait too long. I see a lot of times where people, they've had negative experiences in the past either with creative talent that they've hired through agencies or even in-house or through freelance marketplaces. And they've taken that negative experience and then they get gun-shy 'cause they're like, "You know what? We don't have these foundations. We don't have our strategy nailed down and so we shouldn't move forward." Companies will wait, wait and wait and wait and wait until they've got that perfect content strategy and all the guidelines nailed down before they move forward. I would caution against that a little bit. I mean it is important. I want to talk about why and some of the specifics, but the way I like to think about it is really a three-pronged approach to creating content. The first approach is start creating content. Just come up with, I call it the MVP, the minimum viable plan: the minimum viable content plan. Identify what that is. For most companies, that's probably something like one article a week on the blog, one to two emails per month to your audience, just some very basic social media posting. Don't post on social media just to post on social media. Then probably one rich asset, something like an ebook or a white paper per quarter. That is really probably the MVP of like if you're going to do content, if you don't do at least that much, just don't even do it 'cause you don't have any consistency. Start that MVP if you need to without having all of the content strategy figured out. Companies tend to know who their audiences are pretty well even without defined personas, even without defined segments, even if they haven't done that or even if they have done that, that's going to be enough to get you started. Use that MVP, that stage one, as a way to figure out what your strategy should be. Sometimes that's the best way to figure out what your strategy should be is to just actually start doing it and figure out what does and doesn't work, what you do and don't like. Then you want to really define the themes. I would say the theme is extremely important. A lot of times we combine the words "themes" and "topics." In some ways they're the same. In other ways, they're not the same. A theme is like a central thing that we're always going to come back to and you don't have many themes. You might only have one or two themes. You may have one theme to two teams per primary audience segment. In our business, we're serving brands and agencies who are the buyers, but then we also serve our freelance talent network. That's out of a totally separate audience. We've got really two themes. One for the brands and agencies. One for the freelancers. You don't want too many themes. You can evolve and change your theme over time, but you don't want too many. Our theme is "better voices, better content." That's our theme. Our marketing, when we talk about things, it doesn't matter if we're talking about how to rank in Google. It doesn't matter if we're talking about how to run a lead generation campaign. It doesn't matter if we're talking about how to write an article. We're still getting back to "better voices, better content" and the value of valuing the relationships that you have with your creative team, giving them the freedom to be creative, treating them like businesses, having basic organizational foundations that respect their time and get you what you want. I would start with the theme. The theme is probably the most important thing. Then the topics are those key things you want to talk about. We want to talk about how to hire people, how to work with them to create content. We want to talk about how to rank in search engines. Those are the topics. I think you have to have the themes and the topics to really have a good foundation. Then I would say the next thing is having a basic governance plan. Don't let the word "governance" scare you. It just means what are your approval processes? Who's in charge of sending out assignments? How long do you expect things to be turned around? When you request an assignment from a writer, what is your turn around time? Do you want it back in five business days, 10 business days, two business days? You can document that pretty easily. It doesn't have to be, again, that formal to start. Just I would say the basic things are turnaround times in terms of assignment to due date, expectations for revisions. Are you going to request revisions from writers or any creative for that matter or you just going to handle those things in-house? How many revisions would you want to cap things to and then what type of timeline would you expect on those as well? Then when it comes to the final approval process, how many approvers do you have in your organization? I would say rule of thumb have as few as possible. You don't want five people to have to approve anything, but in a lot of cases you do have two or three or even four. What are those steps and what are the expectations? Another thing we created, we call it "the content commitment." When we work with companies, we actually outline all these things. We go, "Okay. We've got to create a concept. You have to approve the concept. Then we have to create an assignment, find the talent, send it to the talent. The talent has to write and/or design the piece. We then have to review that and go through revisions back and forth until we're satisfied to turn it back over to you. Then you have to review it and approve it or provide revision and feedback to us. You may even need to do two approvals on your end before it can even get back to us." There's all these steps. That's the governance. That's the flow. It's actually really important to put timelines around those things. You're never going to hit every timeline, but it's important to know that from a time that we have an idea or a concept and we decide we're going to run with that concept, I'm not going to have a piece of content done for 25 days because every single thing I just mentioned in the middle has steps and procedures that have to happen. Yeah. I would say themes and topics, your governance and then just really understanding who's on that talent network that you have and whether it's internal or freelancers, and you can really be off to the races. Anna Hrach: Nice. I love it. I feel like you just dropped the mic. I feel like you gave so much amazing information in just those five minutes there, but agree with you entirely and love the entire concept of MVP. I hope everybody takes that away that not to sound like a cliché, but done is better than perfect. As long as you have those guidelines and you have that box in, that sandbox to play in. You have at least defined that people can go. They can start creating content, but they just have to have some sort of framework established. I love it. I think you just gave unbelievable information that everybody's going to really enjoy. Yeah. I know Randy's going to go back to his team now and be like, "Look." Randy Frisch: Yeah. They're going to have a lot of work and they're going to be like, "We hate you short term," but long term they're going to love it. Anna Hrach: Long term, our life is going to be easier. Joe, I would love to just wrap it here 'cause I think you gave some amazing information, some great advice, but don't go away 'cause we'd love to get to know more about you personally now that you've dropped all of this amazing information on our listeners. Stick around and we have just a couple of personal questions to wrap up. Randy Frisch: All right. 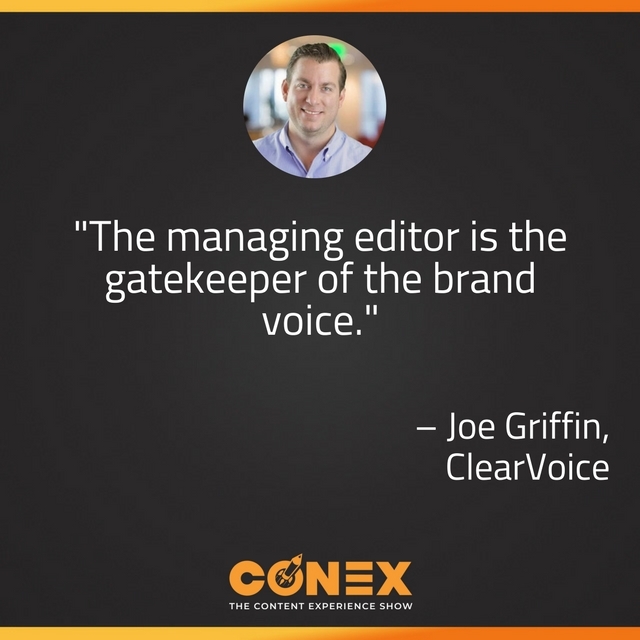 We all now know, Joe, that we have to check out ClearVoice 'cause we got to get our team creating better content, aligned, but we're also curious always to get to know our guest a bit. We got to do a little bit of digging with you before we hit record today. We learned a little bit about your obsession for video gaming. It was clear that I'm a novice, just as I am now creating guidelines and voice compared to you, but maybe you can give us an idea of where you geek out on that stuff. There's one game called Europa Universalis. It's a really great kind of historical game where you're trying to seize like the Ottoman Empire or you're trying to build armies in Spain and France. It's just really cool. A lot of war games. Then I've really, even really hate to admit this, but there's a game called DotA. It's kind of like League of Legends type game that I still find myself playing really a lot more than I should, but yeah, that's definitely one of the things that takes up my free time when I'm not taking care of my two kids and married and got a house and that whole thing. That's really where most of my time goes, but when I get some of that selfish free time: video games. Anna Hrach: There's absolutely nothing wrong with video games. I'm a massive fan. I will defend you no matter what on this one. Randy Frisch: I also think for the interest of your relationship with your kids, maybe less so your wife, you need to play video games so you can connect with them. That's what I tell my wife all the time. I'm still playing NHL, I guess it's 2018, now so that I can connect with my kids on that whole other level. I admire you for it. Let me ask you this very controversial question on video game these days. Are you a fan of VR or a non-fan? Do you think it's just too real? Anna Hrach: Like plenty of swinging distance? Joe Griffin: Yeah. Yeah. There's just ... I don't know if it's cameras or what they're setting up, some type of other. They've got these things on tripods. It's serious stuff. I don't know. I think it's like maybe more of an ... Some people probably love it in their house, but it seems like it's one of those things that maybe, hopefully takes off more as a cool experience. I've seen 'em popping up where there's these VR rooms that you can get and stuff so I don't know. That might be pretty cool. Randy Frisch: Or I saw it, they had it at the airport the other day when I was waiting to board my flight, which thought was a really cool place just to, to your point, try that experience. Speaking of experiences this is definitely a big part of how we deliver better content experience in chatting with you today. Learning about the right way to get content out and raise that bar. I think everyone who's tuned in has learned a little bit, which is always our goal here, Joe. I thank you on behalf of Anna at "Convince & Convert." I'm Randy from Uberflip. 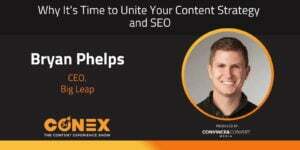 This has been "Conex, The Content Experience Show." If you've enjoyed it, go check out all the other podcasts that we have, whether you're on Spotify, whether you're on iTunes, Stitcher, Google Play, pretty much anywhere these days, you can find our podcast. Leave us some feedback and let us know what we can do to make it better. Until next time, thanks so much for tuning in. Thanks, again, to Joe. Joe Griffin: Thank you very much. It's great to be with you.